Archway Infinity Scarf New FREE Crochet Pattern! Introducing, a fun and flirty way for you to walk into spring with this new free crochet pattern from YarnWars, the Archway Infinity Scarf! The Archway Infinity Scarf offers just what you need to dress up your business or casual everyday wear. You can make this a thick plush scarf to warm you through to the end of winter, or as the pattern calls, use a light weight, nice airy yarn to really dress up your everyday fashion! Scarves always give you the opportunity to accessorize freely and with this lightweight stunning choice, you will catch many eyes! 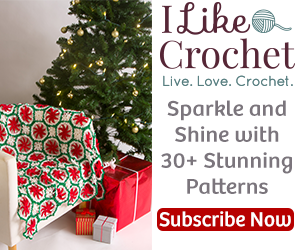 With spring around the corner, many of us are looking for great gifts or craft fair choices… make this a show stopping choice with your favorite yarn, and even better, you can work this up in no time at all with this free pattern! So easy, so fun and so fashion forward, make sure to add this to your list of makes today! As always, thanks so much for your interest in my pattern! Click here for the Archway Infinity Dress Scarf Pattern!